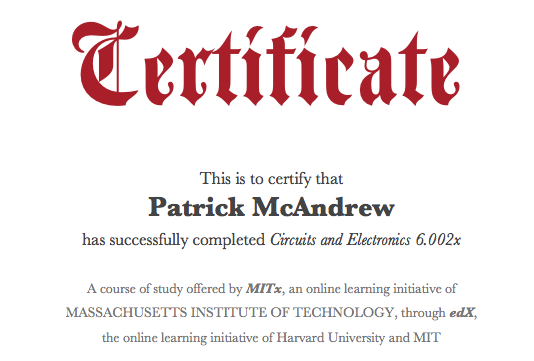 Last year I blogged about my early experience with the MITx course 6.002x Circuits and Electronics and always meant to follow it up with a further post to say how things ended up. The good news is that I received my certificate completing the course with (just) enough to gain an A grade and quite a satisfying feeling. As a leisure activity I enjoyed the challenge but rather worryingly found out that I responded more to the assessment driver than I expected – I think I might have been more pleased with myself if I had been cooler and more laid back about actually getting the (officially meaningless) certificate. One year later the content has faded away and I have not designed or analysed any electronic circuitry 🙂 but I am still very glad I took it. Since then I have taken part as a learner in three further MOOCS. The Google Power Searching MOOC – this was interesting as it uses Google’s Course Builder. Much easier than the Maths of MITx 60002x and not that engaging. But it has meant I now use the advanced tools in Google a bit more than I did before so has made some impact on my work efficiency. The eDx course in programming in python CS50x. This is my “failure”. I made three attempts get started and got caught out by multiple logins so gave up at the first hurdle. Not completing puts me in with 90% of others (actually for this course via Katy Jordan’s useful summary of MOOC completion, in with 99.1% of the others). Coursera’s rerunning of Andrew Ng’s Machine Learning course. This is a classic alongside 6002x. Rather lighter though with a strong programming element. Very assessment driven. Two or more assignments every week which have to be in the same week the content and questions are available. Just finished and I made it to the end completing all assignments and programming. Overall slightly slicker than the earlier 6002x experience. But I will only watch videos on high speed and again ended up reading assignments and transcripts rather than watching videos. 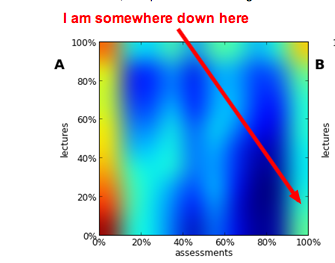 I *might* have an application for what I am learning in reanalyising some survey data but still not sure it quite fits with what I have learned. MOOCs continue to be interesting learning experiences. My use for slightly off the side professional development fits well with their strengths and seeing them as a leisure activity. The assessment driven group also shows up in the analysis reported in an interesting paper by Daphne Koller, Andrew Ng, Chuong Do, and Zhenghao Chen . Using techniques explained more fully in the Coursera course I have just take they demonstrate both a mathematical explanation of completion (i.e. to model those taking courses as two populations; those who complete, and those who don’t – the trick is to know which is which) and also cluster people into different groups based on factors such as how many video lectures have been viewed against the assignments completed.. There are some signs that MOOCs may have peaked a bit. I think there is more to come and courses are evolving so that they will have a roll in learning in the future. What that future is I am less sure of, for me the link with formal is not clear – as a good way to carry out learning for interest they are fine – however that does not meet all of the hopes that we have for open learning.